1,864 km of cycling - as part of a bicycle world trip - from the Nepali border to Chandigarh and uphill to Manali, via Manali-Leh-Highway cycling the world's highest mountain pass roads to Leh in Ladakh and then westwards to Srinagar in Kashmir, from there by bus to the capital Delhi. 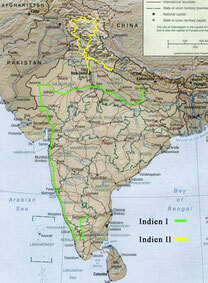 Do you like Cycling India II? I crossed the border and found myself back in India. The tremendous heat right before the monsoon's arrival was hardly bearable and I had anyway planned to meet up with Hugo from Belgium, who was cycling around since three years, in Manali for cycling together the Indian Himalayas. Therefore I went quite straight through the Indian plains south of the Himalayas without staying anywhere longer than just overnight. I passed Haridwar and Chandigarh and began to climb the first bends into the green and densely forested mountains. But as I was sick once again, I had to surrender before reaching Manali and forced myself to a day of rest before going on to Manali. Finally arriving there, I got rewarded with the unique and rather ugly experience of visiting an Indian hospital. Although not totally recovered, I felt much better after ten days of rest. In the meantime Hugo eventually had made his way to Manali, he had been sick as well. Finally we were ready to attempt Manali-Leh-Highway. A small road, open and passable only for around three months in summer, it was an important supply route for Leh in Ladakh with the world's highest mountain pass roads. At least regarding the altitude this challenge was probably one of the most extreme that could be done on a loaded bicycle. Landslides, river crossings, often just a muddy single lane track and the extreme altitude made this trip everything but easy. Me still taking antibiotics, we approached the first pass, while climbing from 2,000 m above sea level up to almost 4,000 m. Rohtang La, packed with heaps of Indian tourists, who came up here to experience their first snow. On the other side of the pass it got instantly quiet, besides a couple of trucks we got the world for ourselves and we finally had reached the "real" Himalayas! With breathtaking views we descended on a muddy and bumpy track with endless hairpin bends. In one of them it suddenly happened: On the lose gravel my bike started sliding and so did my knee on the ground. Fortunately I got stopped before dropping into the abyss. The bicycle was ok, but my knee looked everything but that. The following four days we cycled through amazing and impressive landscapes on mostly rather bumpy tracks up and down, climbing the mountain passes Baralacha La (4,829 m) into Ladakh, the Gata Loops up to 4,911 m above sea level and Lachlung La (5,065 m). We lodged ourselves in decent nomad's parachute tents, which for much of the way were the only places for staying overnight or getting a hot meal. One night we were allowed to stay with the Indian Army in their camp and in fact had dinner with them. Two days ago my stand broke, but when crossing the imposing Gorges of Pang a far more fatal thing happened: After more than 33,000 km the freewheel of my rear wheel's XT hub broke down. Pedaling forwards as well as backwards without any grip! Fortunately the last 5 km to Pang, a simple summer-only tent settlement, were mostly downhill. If completely broken or just dirt and mud inside was just possible to figure out with suitable specific tools and so it seemed to be the end of my Himalaya trip. Right before attempting the world's secondhighest mountain pass road and in the middle of one of the most fascinating and most gorgeous landscapes I had ever been to, it seemed, that I had to put my bike and my luggage in a four-wheel drive or on top of a bus or truck. In one of the other tents I organised a 4WD with driver, who was lying in the tent suffering from altitude sickness, for next morning and I was deeply dissappointed that I couldn't cycle neither the way to Leh, nor the road from Leh to Srinagar in Kashmir. If at all, a suitable hub would have been available at the very most in Delhi and even this was rather unlikely. It was even more unlikely, that we would meet other cyclists and of course no one would ever carry a spare hub across the mountains, all the more fitting to my tyre! But somehow I found myself incredibly lucky again, when Karin and Peter from Holland arrived at the tent camp. Not much later was the incredible clear: They had a hub with them and, incredibly, it in fact fit to my tyre! I was so thankful that the both of them were ok with giving it to me and I was so thankful that all three of them were happy to do a day of rest and so next day we changed the hub and set my spokes. Finally we got started the following day. We climbed Taglang La, with its altitude of 5,330 m above sea level the world's secondhighest motorable road, and two days later we arrived in Leh. Ladakh's biggest town, after days with just lentils and rice, it appeared to be a paradise with pizza, chocolate cake and apple pie! I got once again sick, but nevertheless we organised a permit to cycle further north into restricted area for climbing the world's highest mountain pass road Khardung La. Four days later, together with Peter, Javi from Spain and his friend from France, we started the climb without luggage. On its top it got cold, even a little snowy, but all of us eventually made it up there! Having visited imposing Thiksey Gompa, the next day we sadly had to say goodbye to Karin and Peter and started heading west for Srinagar in Kashmir. Six breathtaking days with stunning mountain views and climbs of the last three mountain pass roads Fotu La (4,127 m), Namika La (3,880 m) and Zoji La (3,645 m), before reaching the green and forested mountains of Kashmir. The more close we came to the ceasefire line with Pakistan, the higher the presence of the heavily armed Indian Army. Right before reaching Srinagar, we found ourselves back in the chaotic and deadly Indian traffic and its heaps of people everywhere around. Srinagar with its tranquil lake full of houseboats was the epicentre of the Kashmiri trouble and it was heavily militarised with sandbag bunkers at road junctions and heavily armed paramilitary troops on foot patrol. Furthermore it was monsoon and so, for the very first time, we put our bikes on the roof of a bus. Because of a landslide it took us about 30 hours to get to New Delhi.